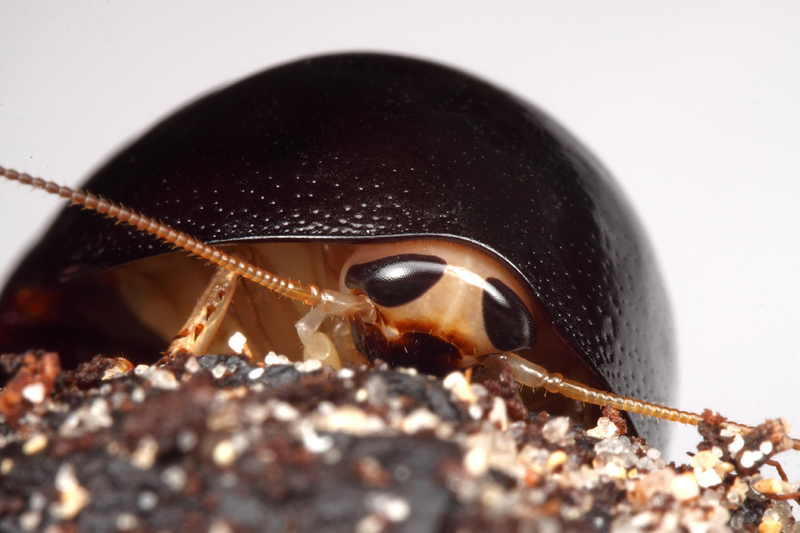 It’s a pill bug… no, it’s a roach. It’s a pill roach! Earlier this month I made a quick trip out to California to see my good friend Chuck Bellamy receive his Honorary Membership in The Coleopterist Society. While I was there, I got a chance to spend some time with Chuck’s labmate Martin Hauser. Although Martin is a specialist of flies, he shares my fascination with unusual arthropods of all types and made available for me to photograph this adult female Perisphaerus sp. (order Blattodea, family Blaberidae), or “pill roach”. Seventeen species from southeast Asia and Australia have been described in this genus (Beccaloni 2007), but which (if any) this individual represents remains unknown. In contrast to ”normal”-looking males, adult females exhibit a ”wingless, half-ellipsoid” morphology. 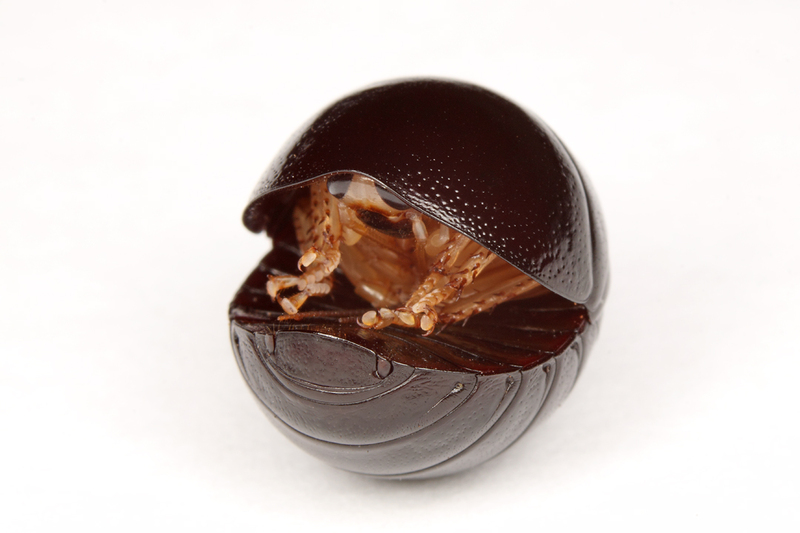 The most obvious characteristic of species in this genus is the ability of females to roll up into a ball; i.e., conglobulate.¹ Clearly this is a defensive morphotype, but curiously only females possess this ability—males are winged and exhibit the more flattened morphology typical of many cockroaches. Martin and I were unable to get this particular individual to completely enroll (we must not have been scary enough), but when it does the posterior abdomen fits tightly against the pronotal margin, covering all sensory organs and leaving no soft tissues exposed, gaps to enter or external projections to grab (Bell et al. 2007). ¹ I must thank Brady Richards, who, in his answer to ID Challenge #18, used this word to coin the phrase that would eventually become the title of this post. Adult females apparently exhibit not only maternal protection but also nutrition. But why should only females and not males exhibit this defensive morphotype? One would think that both males and females are equally threatened by predators. Apparently this is related to their unusual form of uniparental (maternal) care (Choe & Crespi 1997). Early-instar nymphs in this genus remain closely associated with their mother and cling to her underside until they reach the third instar. These early-instar nymphs are not only blind, but they also exhibit a narrowed head with specially modified mouthparts that fit precisely into two pairs of orifices located on the female underside between the middle and hind pairs of legs. Whether the nymphs are feeding on glandular secretions or female hemolymph remains unknown, but regardless only a limited number of nymphs can be handled by a female at one time. 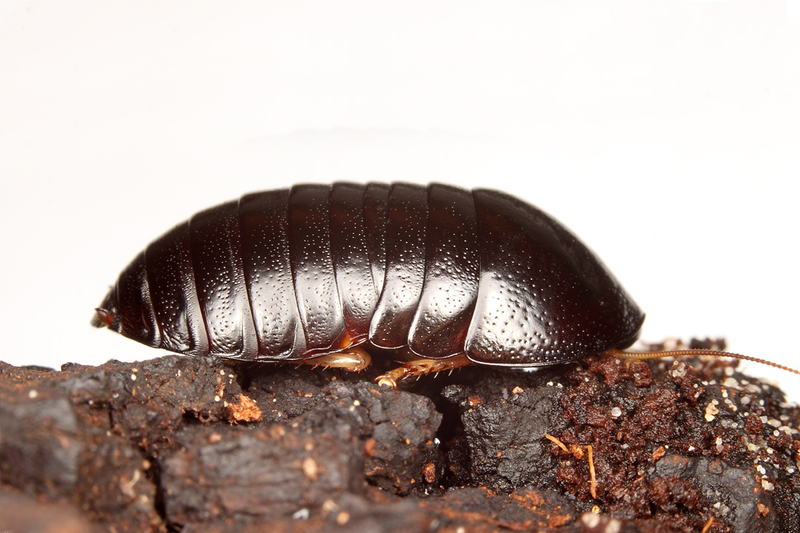 This represents an unusual level of energetic investment in offspring among insects—especially among cockroaches, and thus the female has an interest in protecting that investment. Sealing them up inside an impenetrable ball is certainly one way to protect the nymphs. Despite first impressions, six legs and a very ”cockroach-ish” head belie its true identity. Conglobulation has actually arisen several times amongst arthropods. Obviously pill bugs (a.k.a. roly-poly bugs) are the first group that comes to mind in this regard, but Eisner & Eisner (2002) illustrate nearly identical morphology in two oniscomorph millipedes as well as isopods and Perispharus and also describe strikingly similar behavior by the larva of Leucochrysa pavida (family Chrysopidae). Many thanks to those of you who participated in ID Challenge #18. As of now, the comments for that challenge are closed, and I will reveal the comments and award points shortly. My sincere thanks again to Martin Hauser for allowing me to photograph this most interesting insect! Edit 5/28/12, 12:55 a.m.: For the first time ever, we have a 3-way tie for a BitB Challenge win—Sam Heads, Brady Richards, and Mr. Phidippus all earned 12 points to share the top spot in this challenge. Since these three gentlemen were already the three leaders in BitB Challenge Session #6, there is no change to the leaderboard in the overall standings (44, 42 and 37 points, respectively). However, Dennis Haines (34 points) is hanging close, and Tim Eisele (25 points) still has a shot at the podium. Any number of others following closely behind could also find themselves on the podium if any of the three leaders should falter down the stretch. Beccaloni, G. W. 2007. Blattodea Species File Online. Version 1.0/4.1. World Wide Web electronic publication. <http://Blattodea.SpeciesFile.org&gt; [accessed 27 May 2012]. Bell, W. J., L. M. Roth & C. A. Nalepa. 2007. Cockroaches: Ecology, Behavior, and Natural History. The Johns Hopkins University Press, Baltimore, Maryland, 230 pp. Choe, J. C. & B. J. Crespi. 1997. The Evolution of Social Behavior in Insects and Arachnids. Cambridge University Press, Cambridge, U.K., 541 pp. Eisner, T. & M. Eisner. 2002. Coiling into a sphere: defensive behavior of a trash-carrying chrysopid larva Leucochrysa (Nodita) pavida (Neuroptera: Chrysopidae). Entomological News 113:6–10. 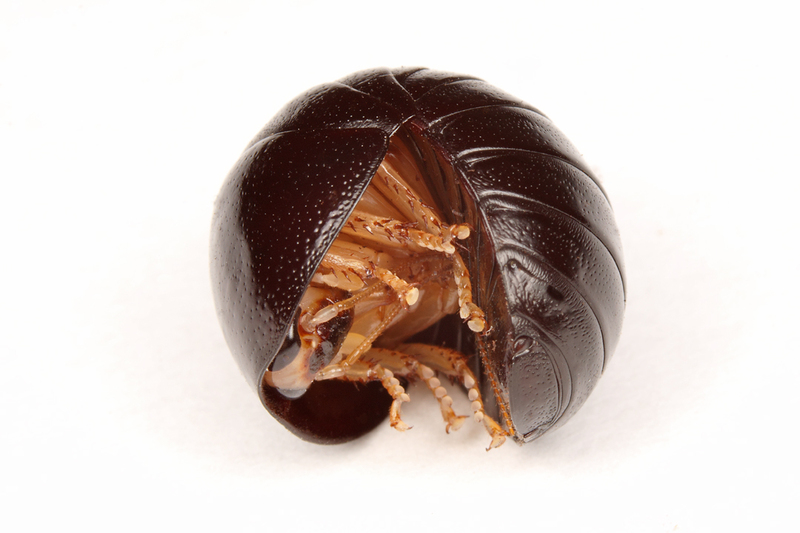 This entry was posted in Blaberidae, Blattodea, Dictyoptera and tagged cockroaches, entomology, insects, maternal care, nature, predator avoidance, science, Vietnam. Bookmark the permalink. 24 Responses to Holy conglobulation, Batman! Thanks to Martin! A very cool insect indeed! Glad to see Brady Richards is still out there looking at this beetle post! I have not heard from him is some time! Excellent photos again Ted! Great job! Hey, Rob! It’s been awhile, hasn’t it? It’s good to see you around, too. Holy Moly! This bug looks like he is wearing an oversize soldier’s helmet! I so love and admire your eye into beetles photography. Your work is full of awesomeness! Thanks – your comment is even fuller of awesomeness! Wow, thank you for showing this creature. Wonderful to read all this information and look at your awesome photos. Thank you Giardinoblu – and welcome to BitB! It is a very pretty cockroach, and it sounds like she’s a good mother, too! She sure does look a lot like she could be one of the Armadillidiidae, though. Good fake-out on your part! Maybe somebody should make a directory of all the arthropods that can conglobulate . . . I figured it would fool most people and was actually surprised at the number of people that got it right. Still, the photo did allow a fairly good glimpse of the legs and head. Don’t you just love that word?! Oh great, I go to the field for a month and then I miss this. Great photos, Ted! It warms the heart to see BugShot alumni taking world-class images! Thanks, Alex—although it’s a little easier when you’ve got a subject like this to work with!